← Southwest Birth Round Up!! My firstborn baby was spirited, to put it mildly. Nursing at least every two hours around the clock (or every 45 minutes), PASSIONATE about expressing his opinion, not needing much sleep, wanting constant touch. As a new parent hearing so many different ideas about how to parent I was drowning in uncertainty - let him cry it out, people said. Start him on solids at 4 months, the breast isn't enough. He should NEVER sleep in your bed, he'll be there until he's 10. But so much of it just felt wrong to me, and I was torn between listening to the loud voices around me and trusting my instinct that said this little boy needed more from me than any parenting tips I was hearing. Then my big sister gave me a copy of The Fussy Baby Book. I admit the title bothered me, though it certainly fit the situation. 🙂 Then I started reading - and reading, and reading, because THIS WAS MY CHILD! But instead of saying I should discipline him or stop nursing him or let him cry it out this book was saying WEAR your baby, keep him close, nurse him when he needs it, co-sleep if that helps you feel better rested (it did!) Unlike many of the other parenting books, this wasn't being written by a doctor with maybe one or two kids - this was being written by a doctor and nurse BUT they were parents to eight kids (including some spirited kids) and that gives them WAY more credibility in my book. They had lived the exhaustion, they knew my pain! They also knew that babies need respect, deserve compassion, and keeping them close helps them feel safe and comfortable in the world so that then they WANT to go explore! And for the record, that co-sleeping, high needs baby is now 12 years old and he hasn't slept in our bed for over a decade. 🙂 He left our bed when he (and we) were ready. All that to say - these books changed my life. I truly thought my firstborn was going to be an only child because I thought I was a failure. I thought I was going to ruin my child, and I had no confidence in myself because what I felt was right (nursing, co-sleeping, baby wearing) I was being criticized for... their book helped me have the confidence to trust myself. That changed everything. So then I had more babies! And as you probably know, baby #3 decided to come just a wee bit early (17 weeks early) and parenting a preemie was NOT the same as parenting a full term baby! But look - The Premature Baby Book. It should be given out to everyone parent with a preemie. Every. Single. One. We had some feeding issues as our preemie got older (in part because of his long intubation time) and our fifth baby had some severe food allergies - never fear, they've got a book for that! The Nutrition Book. I couldn't ask them to sign my (three) copies of The Breastfeeding Book because I loan them all out to clients! It's my most requested breastfeeding book from my lending library. Even my children have Sears' books in their collections - Baby on the Way and What Baby Needs are the best books I've found (and I've read a LOT) to help prepare siblings for their new baby. SO, all that to say - meeting Martha & Bill Sears was the chance of a lifetime. 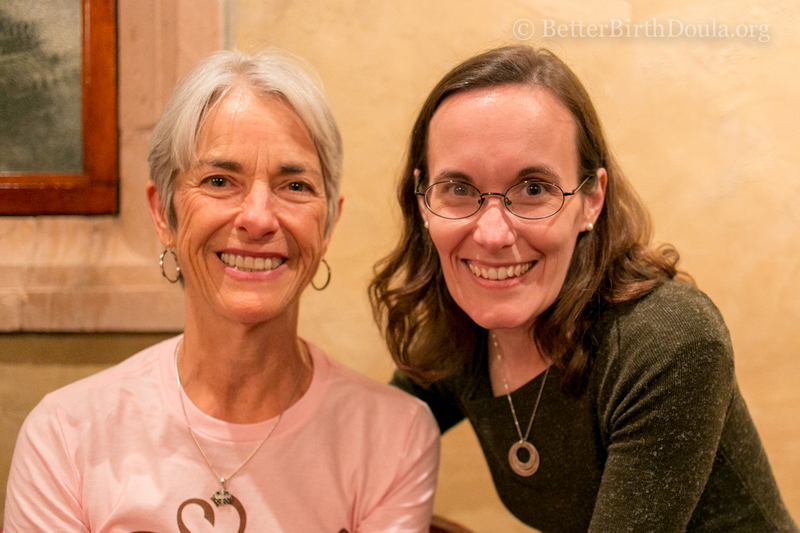 It was wonderful to talk with her about my children, her children and grandchildren, our home birth experiences, how she's shaped my parenting journey, my preemie & his story, and then I realized there was a line of people waiting to talk with her so I stopped talking. 🙂 But I had mentioned charting (which is how we were positive about our conception dates with our preemie) and she approached Mary and me to ask us about the method we used and when I told her about the book I read (Taking Charge of Your Fertility) she had me email her the link. Y'all, she is as delightful and wise in person as she is in her books. I will never forget the experience! This entry was posted in Babies!, Birth, Doulas, Inspiration, Links, Partners, Pregnancy, Prematurity, Readings and tagged Denton Texas labor support birth doula, Doula Resources, New Doulas. Bookmark the permalink.